FastTree can constrain its search for the best tree to try and satisfy constraints that you give it. Each constraint takes the form of a split. For example, if you constrain A and B versus C and D, then FastTree will avoid topologies such as ( (A,C), B, (D,E) ) that do not contain that split. (The placement of E is ignored, as it was not specified in the constraint.) You can specify any number of constraints, although too many constraints will make FastTree much slower: roughly speaking, each constraint costs as much as adding a few nucleotide positions to the multiple sequence alignment. Each constraint can contain any number of leaves, but a split that has less than two taxa on a side is not meaningful because every tree satisfies that split. You can use this constraint file together with a multiple sequence alignment, e.g. Not all of the sequences that are in the MSA need to be present in the constraints file. This script requires both perl and BioPerl to be installed. The -constraintWeight option controls how strongly FastTree prefers to satisfy a constraint rather than reducing the length of the tree. By default, the constraint weight is 10.0. In other words, a join that causes one additional constraint to be violated is treated as if it lengthened the tree by 10.0 more than it actually does. During the maximum likelihood phase, it treats a violation as equivalent to a decrease in the log likelihood of 10.0. These may sound like a lot -- trees don't normally have branch lengths of 10! But if a constraint can be violated partially -- that is, most of the sequences split correctly, and just one is out of place. In that case, FastTree will only assign a fractional penalty. Thus, without a high constraint-weight, FastTree may not satisfy all of the constraints that it could. FastTree tries to satisfy the constraints at every step of neighbor-joining, and it tries to improve the agreement of the tree with the constraints at every nearest-neighbor interchange or subtree-prune-regraft move. In other words, it uses a greedy algorithm to find a good topology, and then it tries local changes to improve the topology. This example shows that this approach may fail to converge on a topology that satisfies the constraints, even though such a topology exists. The taxa are labeled with their constraints (A/a and B/b are the two constrained splits). At the top of the figure, the tree is partially resolved because neighbor joining has not completed yet. 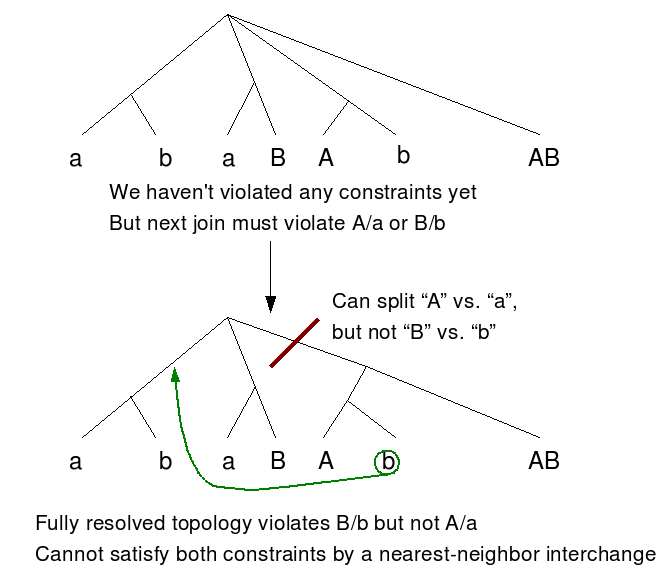 Neither constraint has been violated in the partially resolved tree, but either of the two possible fully resolved topologies will violate a constraint. One of the problematic topologies is shown below. Please send questions or comments to fasttree@microbesonline.org.